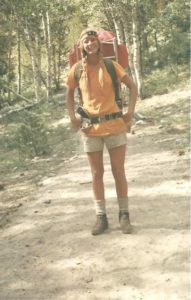 On my one and only previous backpacking trip – a week-long outing in Southern California in 1971 – I had no trouble buying equipment. I went to the nearest sporting goods store and rented a backpack, tried on a few pair of boots, and was good to go. The entire process took only an hour or two because there wasn’t really any choice in what to buy. Not only was the selection limited, but everything was bulky and heavy – canvas tents, huge, external frame backpacks, metal cook pots and canteens – which didn’t bother me a bit. Of course, back then I was seventeen. 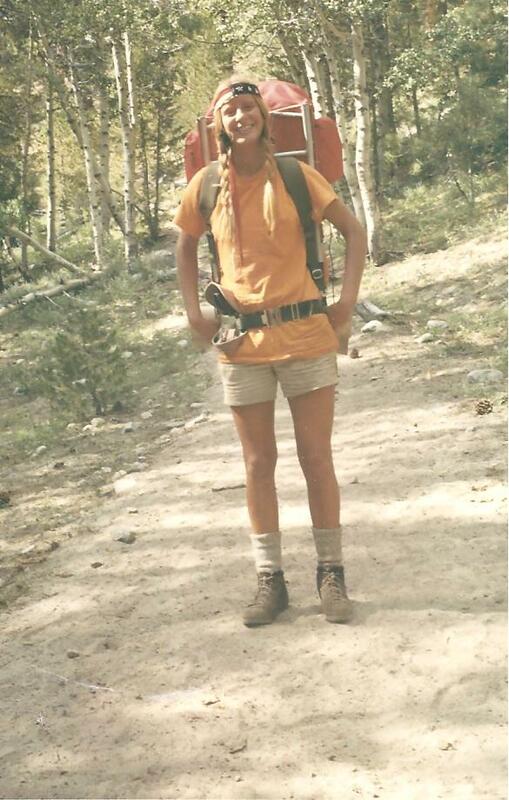 Luckily for me, backpacking equipment has come a long way since then. Everything is much lighter these days, which is an enormous boon for my aging bones. Backpacks weigh less than two pounds. Camp stoves fit in the palm of my hand. Even socks have become high-tech, with moisture-wicking, odor-controlling, blister-reducing “smart wool” options I never could have imagined years ago. Which makes choosing equipment for a thru-hike overwhelming. There is so darned much to learn! Take rain jackets, for example. After getting drenched on a recent day hike, I know that I definitely need one. But how many layers do I want – 3 or 2.5? Do I want a laminate or waterproof coating? ePTFE? eVent? Gore Tex? Pit zips or side vents? And how many psi’s? Every single item of equipment, from footwear to a lowly spoon requires countless hours of research lest I make a choice I’ll regret. As a result, I’ve been spending my days reading countless articles, studying experienced thru-hikers’ gear lists, and skimming online forums for any nuggets of wisdom that will help me avoid a mistake. Everyone has a different opinion, of course. Everyone recommends different options, depending on their personal needs. About the only thing I’ve been able to conclude for sure is that I really need to limit my weight. As a result, I’ve only bought a few things so far — just a few items of clothing and my trekking poles. I’ve held off purchasing anything major until I can winnow down the selection and make an intelligent choice. 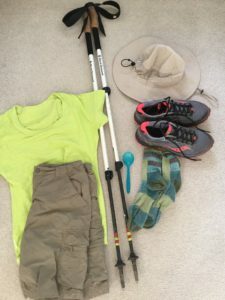 But with only eight more months until the thru-hike, I need to make some decisions soon – starting with the one that could make or break my hike: my pack. Help! If anyone has a recommendation, I’d love to hear your advice! From what I’ve read the Osprey Aura 55 women’s pack is one of the most popular female packs on the AT. Osprey in general about warrantys and refunds, as well as having really nifty (and handy) gadget/upgrades on their packs (whistles built into their buckles, extra straps for holding stuff down or hooking things into, etc.) I have an 18L and love it as a daypack. I really like my Northface Terra 40, so I might end up on the trail with that or with the 55– or I might upgrade to the Osprey. I am awful with making my decisions about gear too! I’ve also heard Gregory makes some decent packs as well. Hope this helps a little? I’ve read good reviews about the Aura except that it weighs over four pounds. I’ll still try it, though. I would really love a woman-specific backpack. I’m tall, though (5’10”), and sometimes women’s gear is too short.hopefully I can find an expert to help me find the right fit. I really love all the features on my Osprey day pack! You are right about all the gadgets.? Thanks, Jac! I have one of their day packs and really like it. I’ll definitely keep them in mind! You’re off to a good start by thoroughly thinking through gear choices and emphasizing going light. I recommend the ZPacks 60L Arc Haul. It repels water quite well, the deep side pockets keep items secure and easy to reach, and it’s lightweight. The torso is adjustable. I also have the Osprey Exos 58 pack and find it quite comfortable. We’re the same age and experience level. 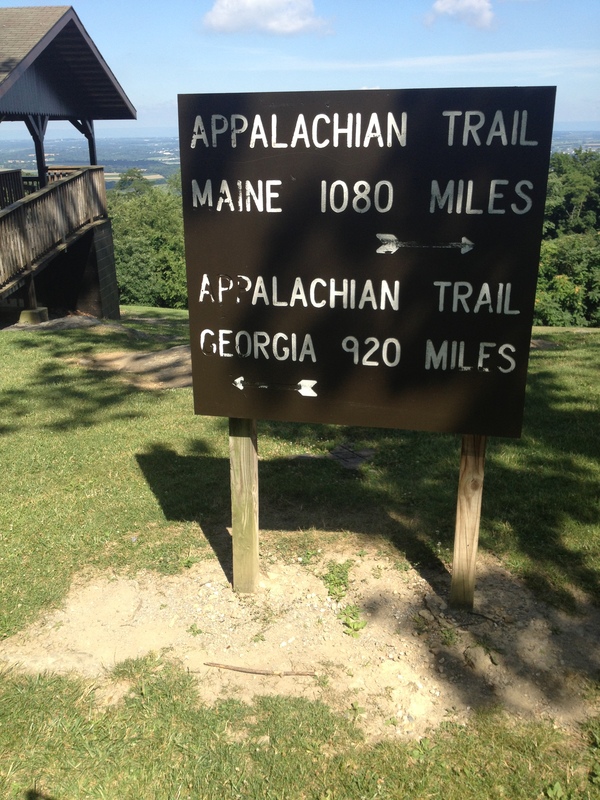 You’re going to love hiking the AT! Go light, go slow. I haven’t heard of the ZPacks ARc Haul, Slack Packhiker. I’ve been reading good things about the Exos and ULA Circuit, and of course, I want to try on the Osprey Aura, too. But I’ll definitely add the ZPack to my list. I’m hoping to make the choice within the next few weeks so I can start training with weight. My husband and I have been doing sections of the AT every weekend, but just local day hikes (nothing overnight yet). We do anywhere from ten to sixteen miles each day, but of course, we aren’t doing more than a few days back to back, and we aren’t carrying any weight other than snacks and water. I’m hoping that in the next eight months we can work up to doing the same thing carrying weight, then try to go on some multi-day section hikes. I am worried that at our age, the day-after-day part might be our biggest problem. I read in someone’s blog yesterday that younger hikers get stronger the longer they hike, while older hikers wear down. What kind of distances/rest schedule do you advise? Your preparation is impressive! You’ll be a-okay when the time comes. Heck, you could start today and do well. I began at 7 miles a day and upped the miles to around 10 and as high as 13 over 6 weeks. Unfortunately, my heel snapped apparently south of Hot Springs. I woke up with a swollen ankle, hiked 7 miles to Garenflo Gap and shuttled into HS. I left the trail and was diagnosed with a heel fracture related to bone insufficiency b/c of low Vitamin D, (rather than a break from external forces). I’m on Vit D supplement now and return to Garenflo Gap in 2 weeks. Can’t wait! I tell you all of that to say, it might be a good idea to check your Vit D level. I get plenty of southern sun and good nutrition and thought I was okay. Wow. I never would have thought about a possible vitamin D deficiency. Like you, I would assume that since you are outside hiking all day that that’s the last problem you would have!!!! I plan to have a physical this winter, so I’ll be sure to check that out. I’m sorry to hear about your heel, but am awed that you are getting back on the trail. Are you still planning to hike the entire trail? You should email me when you get up my way (WV/MD). Assuming we are in town, we can pick you up and treat you to dinner. I’d love to hear about your experiences!!!! I forgot to add that we saw a whole slew of novice hikers on the trail last weekend overloaded with enormous packs. Every one of them was huffing and puffing in the heat, and most of them were a lot younger than us. It really reinforced my conviction that I want to go light!!! Congratulations, Salty Dog! My husband will be 64 when we hike, so I’ll tell him about you. We are thinking of getting hammocks because we’ve heard from other hikers that they are much more comfortable than sleeping on the ground. I’m glad to hear that you did it that way. In general, how many days did you hike in between zeros, and what do you recommend? I thought we would rest at least one day a week. Is it better to plan for more, maybe every fifth day? This ought to be interesting, as all of my gear is old (I hike a lot 25 years ago, and some since, but still have the old reliables and nothing new). I am considering the hammock thing, but, whoa … information overload. The pack weights I’m reading about from the ulta-light devotees is impressive. I’m right there with you, TBR! I feel as if my head is going to explode from everything I need to learn! The hiking world has really changed. On the other hand, I am thrilled that everything is so lightweight now. There is no way I could lug a fifty pound pack through the mountains at my age. I resisted the idea of hammocks at first. I had assumed I’d share a tent with my husband, which would at least give me the illusion of safety (and he could carry the tent, too, lightening my load!). But we started asking people out on the trail what they were using and were really surprised by how many either used hammocks or wished they did. Everyone told us how comfortable they are. So that’s what we are going to do. Wow, I’m in envy. I am hoping to do this in 3-4 years, at 64-65. I just bought a Gregory deva and love it been out a few times for 2-4 nights. Heading up to New Hampshire this coming week to give part of the AT a try there. Bryna, it might have been smarter for us to wait for a few years so we’d have a better idea of what we were doing, but frankly, I was afraid that if I waited that long, I might not be able to hike. I already have arthritis in my hips, neck, and feet. My vision isn’t great, and since eye problems run in my family, it is only going to get worse. I figured if I was going to do this thing, I needed to do it now. It helps that my husband decided to retire at the end of the year, so there really isn’t any excuse for us to delay. We just need to learn everything fast!!!! Have fun on your upcoming hike. I’d love to hear how it goes. Please pass along anything you learn!!!! One suggestion – fill your pack up with weight (at least 30 lbs) and hike a few miles before taking off the tags. I thought I had the right pack twice. The packs felt great in the store partially loaded, but were very uncomfortable with more weight and distance. Luckily, I purchased my pack from a great store that let me return and switch the packs until I had a comfortable one. The third one was perfect! What a great idea, Marybeth! Thank you for the tip! Don’t limit yourself to women-specific packs, and keep in mind it is your torso length, not your height, that drives the size. “Women’s specific” packs generally have narrower shoulder and hip belts, as well as shorter torso lengths than men. I am 5’7, 17-18 inch torso, and a men’s Osprey Exos 58 has carried 35 pounds for me comfortably and securely from the Rockies to Patagonia. I plan on using that on my AT hike next year. As for hammocks, this is definitely something you want to try before you buy. At 64, I am not as flexible as I used to be, and the nice firm ground works better for me than a hammock. I love the hammock idea, but I just wake up sore. Great advice, Linda. Next week we are going to stop at an outfitters to get measured and properly fitted for a pack. I plan on checking out the Exos because I’ve read good things about it, plus a few other packs. I’m hoping that the people at the store can advise us on getting the best fit. A lot of women’s items don’t fit me well because I’m so tall (5’10”). Most of my height is in my legs, but my torso is still a little longer than most. I’m mostly worried because I have arthritis in my neck and suffer lower back issues, so I want to make absolutely sure I’m carrying the weight properly. I also want to get the lightest pack I can that will also fit my gear. As far as the hammock goes, I’m surprised that it bothers you. I’ve heard the exact opposite from most people who find it much more comfortable than being on the ground. I guess it goes to show that we are all different and that we need to find what works for us! I hope I see you on the trail next year:). I hope you weigh in with followup posts. I’ll be most interested in what you discover and what you decide to use. Do the homework for us!